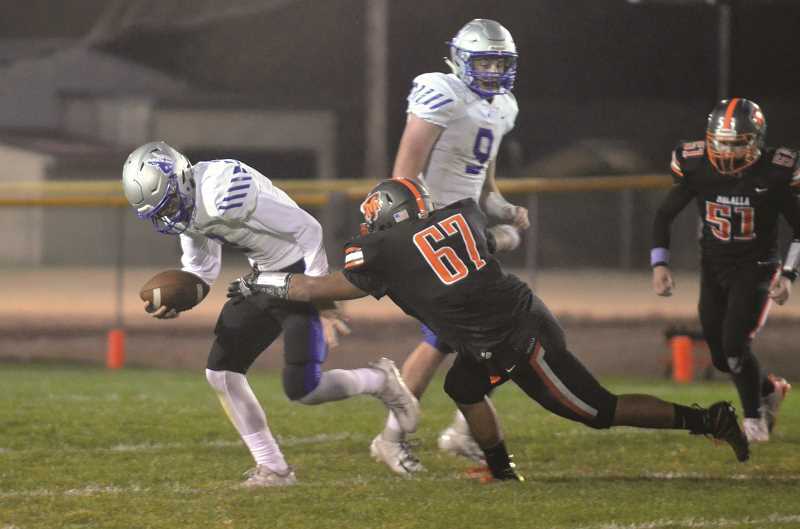 While 2018 was not the rejuvenation the Molalla High football program hoped for, it was indicative of steps in the right direction. 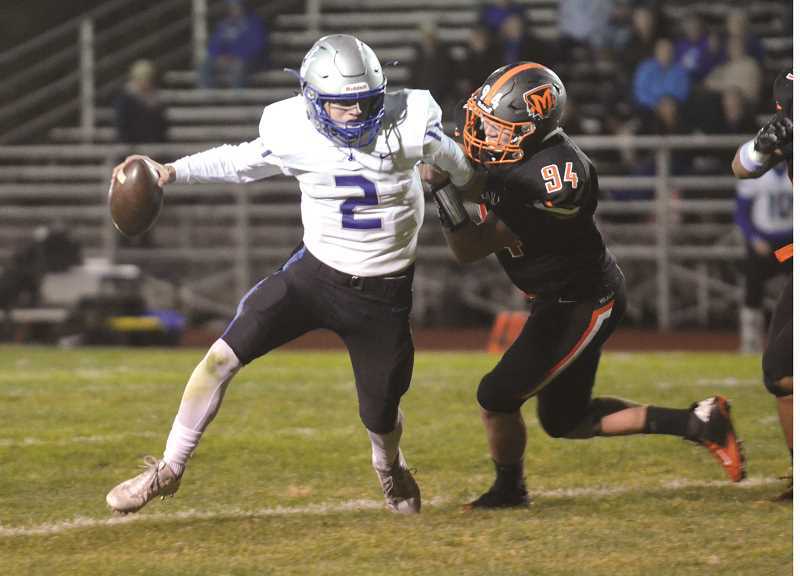 Molalla football team was forced from the postseason scene after falling 12-6 against North Marion in the play-in round on Oct. 26. The low scoring affair was indicative of the progress the team had made, but also of a lingering obstacle to success. The defense managed to keep the North Marion offense, which in its previous matchup against The Dalles had put up 40 points, limited to just a dozen points. Inversely, the Molalla offensive unit only managed six points in that same time. It's something Molalla head coach Tim Baker noticed as a trend early on. "It seemed like we were headed in the right direction," Baker said. "In the beginning of the season, we were in the red zone numerous times in games and weren't able to finish. We'd get penalties or dropped balls, a myriad of things where we weren't able to finish on offense. Our defense played very well, kept us in games, but unfortunately our offense sputtered at times." Apart from blowout losses to the No. 1 and 3 teams in the state, Banks and Seaside, Molalla's defense was able to keep things competitive with several heavy hitters. That included a rejuvenated Woodburn squad that made its debut at 4A this season and earned a state playoff game. Baker is proud of his defense's resilience, and thinks that, given more numbers, success could have been more frequent. "We had some difficulties in spots, but overall I thought the team kept its chin up over the season," Baker said. "They continued to drive forward. Basically, we're just very thin. Numerous players were playing both ways. By the time we hit the second half, there were kids cramping up and kind of tired, we weren't able to finish games. Defensively, I was very happy with the direction we were and are going." Road wins were elusive this year, as the team went 0-5 in unfriendly territory. Whether at home or on the road though, there was an aggressive, vocal minority of the fan base that made itself heard to the sidelines. The yells and shouts at the coaching staff and players didn't affect Baker's coaching, but he wondered if it may have affected the kids mindsets. "It can be difficult because the kids do hear things going on that fans and parents are trying to coach from the stands," Baker said. "Maybe that gets in the kids heads. When the kids are playing I expect them to be in the game and only concentrate on the game and block out what's behind them. But they're kids." While Baker ultimately loses strong seniors to graduation like linebacker Ricardo Gatica, running back Jeff Larsen, and Silverio Lopez Hansen. Returning talent like quarterback Damian Pingo, and linemen Bo Edwards and Brady Laccino give optimism for the future. Couple that with a dedicated freshman class, and Baker is excited about the prospects. "Football is a commitment," Baker said. "I want kids to play basketball, football, wrestling, whatever, and have the whole high school experience. But you are part of a program, and it is a commitment. We work out in the summer just like all other schools, and we're trying to build towards something. We're just starting to do that. "Building up in the weight room, we have to get stronger," Baker continued. "This group of freshman that came in this year, they are committed and that's the class we saw the most of in the weight room over the summer. I'm not asking them to be there at everything, but to be there and be a part of something. Not only to get better, but bond with your teammates. I think chemistry is extremely important in team sports. That's an opportunity for weightlifting, 7-on-7, team camp. I'd like to see that as we build this program going forward."